Ottawa Humane Society: IAMS Wiggle Waggle Walkathon – More than Just a Walk for Dogs! IAMS Wiggle Waggle Walkathon – More than Just a Walk for Dogs! 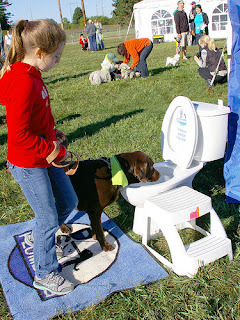 A dog grabs a drink from a toilet water bowl! The 25th anniversary IAMS Wiggle Waggle Walkathon is so much more than just a dog walk. The original organizers would be amazed at how it has grown since the first event in 1988. This year, our goal is to raise $185,000 for the Ottawa Humane Society’s animals. Walkers now come to our IAMS Wiggle Waggle Walkathon without a dog and simply walk because they love animals and the great work that the OHS does in our community. It’s common to see couples, families and co-workers all walking without a dog in tow. We have added a 5K and 10K run this year. We’ve also added a unique-to-Ottawa 3K Companion Animal run so that runners can Run for the Animals with their favourite four-legged friend. Raise or donate $125 and receive an entry ballot into our WestJet draw for 2 tickets to anywhere they fly! Great food from Ottawa’s Food Trucks!